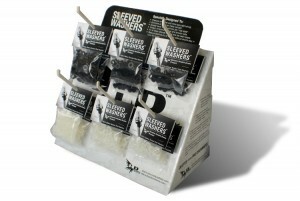 Many of the most respected and well known music shops across the USA are currently carrying our SLEEVED WASHERS. This simple, effective, and innovative product is a must for any music or drum shop that wants to carry a complete range of percussion accessories. SLEEVED WASHERS come in packs of 20, 50, and 100 washers. Each pack comes hole punched and ready to display. Each package also has information on the header card that explains the benefits and use of the product. By offering larger quantitie packs than competitors’ flat nylon washers, you are able to make more money per sale, while saving the consumer money as well. Even though our SLEEVED WASHERS are priced better than comparable flat washers, you as the retailer are still able to achieve higher profit margins. This product is a winner for everyone involved. We treat our distributors right by making the ordering process easy and always shipping within one business day of receiving payment. If you would like to carry Hendrix Drums SLEEVED WASHERS in your store. Please contact us via our contact page, or call us at 334-790-9426.